SALVATION WORSHIP MINISTRIES USES PAYPAL TO ACCEPT ONLINE DONATIONS. If you would prefer mailing a check directly to Salvation Worship Ministries, please mail to the address below. You can specify in the memo section what you would like your gift to be used for. Giving to the greneral account and most needed will help us with month-to-month costs such as building rent, instrument upkeep, and much more! 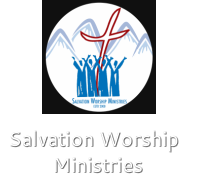 With so many different areas of ministry that the Salvation Worship Ministries does, there is much need for workers to help! By partnering with a ministry worker on a monthly basis you will be part of making it possible to fulfill the call of God upon their lives. Our promise is that 100% of the funds donated to our ministry workers will go directly to their support. These funds will allow us to help disciple and train young and old believers by providing discipleship book series and supplies to help them grow stronger in the Word of God. Donating to host a worship or youth conference will allow us to bring 300+ people under one roof, for 2-3 days to go through a book of the Bible and train them in the Word. In addition to the main sessions, we host workshops on individual topics. Your donation will help provide the venue, food, and translation for the entire conference. Concerts are a powerful tool to help reach many people at one time. During every concert, we set aside time to share the good news of our living God and give an opportunity to know Him as their personally Savior. Our goal is to hold 3-4 concerts a year all throughout the country of Nepal. By donating to these concerts, you will be playing a vital roll in helping sharing the gospel with the people of Nepal. We were created to worship and praise God and we are continually trying to keep our instruments up-to-date and in the best shape. By donating to help purchase worship instruments, it will help us provide the best possible equipment to our worship team members and music students. There are many students that have expressed the desire to come and study at our newly started School of Worship (9-month certificate course). Many of these individuals are from villages outside of Kathmandu and would need housing provided for them. By sponsoring a student, you are not only allowing the them opportunity to learn from the Word about what worship was intended to be, but also providing housing, food, and school supplies for their time at the School of Worship.